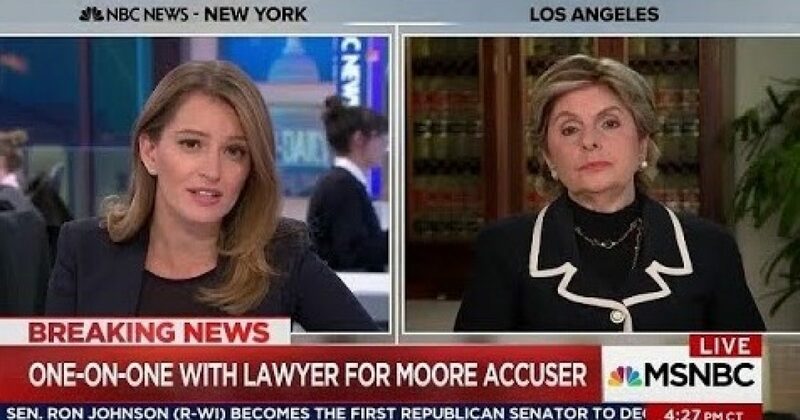 [VIDEO] If you are going to bring sexual harassment charges against Judge Roy Moore as Gloria Allred has done for her client, You should be better prepared. If MSNBC’s Katy Tur can trip you up with a question, your whole case begins to look like the falsehood that it probably is. Certainly, Ms. Alred should have been prepared for this question. Maybe she was expecting a soft pitch interview. Watch this. TUR: Does your client, Beverly Young Nelson, remember him signing it? ALLRED: She remembers — well, she remembers being with him. It was on the counter. She alleges that he took it, that he signed it and she was thrilled that he had signed it, because, as far as she knew, he was a D.A. and that was an important position. TUR: So she saw him sign it? ALLRED: I don’t believe at the time she had a clue whether he was an assistant D.A. or a D.A., but he signed it, she took it. As far as she knows, I mean, there’s no reason for her to think it’s anybody’s but his signature. TUR: But did she see him sign it? ALLRED: You know, I don’t — I haven’t asked her if she saw him, but we did describe what happened that evening in question. What she alleges was that she put it on the counter; that I think she asked to sign — or that he did sign it. That’s all. TUR: I ask this, because it seems you’re not 100% sure that it is his signature, and if you’re not 100% sure that it is his signature, why would you show it at a press conference? ALLRED: Well, why would — you know, why does anybody doubt that it is his signature?